Are Islam's Allah and Christianity's Jehovah God the same? Nathan Jones: Soon after 9/11 we as a nation finally had to look hard at Islam and decide whether it had to do with terrorism or if it didn't. Then President George W. Bush came out after the fall of the twin towers and declared that we needed to have peace with our Muslim brothers because their god is our God. He claimed the Christian God and the Muslim God are one and the same, but is that true? Eric Barger: No, that's not true. However, that was a political statement. Indeed President Bush is a Christian, I'll give him that much, but I don't think he understands what the differences are between Christianity and Islam. There are also a lot of people in the Church who are confused about this as well. We even see some evangelical Christian leaders who are claiming that Allah and Jehovah are the same God, by either the different ecumenical actions they are taking or by the things that they are saying about Islam. No wonder there is so much confusion! Certainly, though, President Bush made a political statement because he has to be the President of all the people in the United States, which includes those Muslims who are living here. Nathan Jones: Who is Allah then to the Muslims? If he's not Jehovah God, then how is Allah different from Jehovah God? Eric Barger: Back during the Seventh Century in the town of Mecca in what is now Saudi Arabia, there were over 300 different gods being worshipped around the Kabah stone. The Kabah monument is a meteor exactly. They believed that their god lives there. This is why Muslims pray towards Mecca wherever they are in the world. They pray five times a day at least. Back in that day there were all sorts of different gods and idols being worshipped in Mecca. A man named Mohammed took it upon himself as the political, spiritual and military leader of his tribe to change the polytheistic practices in Mecca. He believed he had received a vision from the angel Gabriel while he was in a trance state in a cave and was given a command to bring a pure religion back to the world. By the sword Mohammed went about converting people to his viewpoint or it was off with their heads. We see this style of "evangelism" all throughout Islamic history. So, Mohammed took it upon himself to bring his tribal god alone to bear upon the world. Mohammed's god is named "Allah" which means "God" in Arabic. If we were Arabic speakers we might use the word Allah if we were referring to God. But, there's got to be a clear delineation by Christians in the day we live in to discern between Jehovah and Allah as being two separate entities. Also, Esa or Jesus of the Qu'ran and Jesus Christ of the Bible who is God incarnate must also be understood as not being the same. Nathan Jones: Allah was the moon god initially, correct? Nathan Jones: That would mean Allah wasn't the overall God who is all-powerful, he was just the god of the moon. Eric Barger: Allah was the god of the Koresh tribe which was Mohammed's tribe. From the cave experience where Gabriel supposedly had shown him that his god was the only way, Mohammed decided his religion was the only right way and that there wasn't any other way. Dr. Reagan: Islam is a monotheistic religion worshipping they say the one and only true God. Christianity is a monotheistic religion. So, if they both worship the one and only true God, don't they both worship the same God? Eric Barger: They are not worshipping the same God. Jehovah God as shown to us in the Bible to the Jews and then to the Christians is different than the god of Islam. Islam worships the god that Mohammed's Koresh tribe worshipped. If you read the Qu'ran and the Bible side by side you'll see that God must then have to be schizophrenic if He came up with both those books, because they just don't read the same. An example from the Qu'ran, it never mentions Allah as a god a love. Jesus of the Qu'ran is but a prophet. He is not God incarnate. The Qu'ran adamantly proclaims that God had no son. I think the greatest repudiation of Chrislam is from the Qu'ran in Surah chapter 4 where the Qu'ran clearly states that Christians should never speak the word "Trinity" and that we should understand that Allah never had a Son. Dr. Reagan: Islam rejects the very idea of the Trinity. They reject the idea that God ever had a son. They reject the idea that Jesus was crucified on the cross. Islam claims an imposter was crucified in Jesus' place. Islam claims Jesus was never resurrected from the dead. And yet, if you were to invite an Islamic imam to come to your congregation and talk about Jesus, he would get up and talk about how much they love Jesus and how Jesus was mentioned in the Scriptures. Of course, the imam's not going to tell you that they don't believe the things that we believe about Jesus. It's very misleading. Eric Barger: Yes, it is. They do believe that Jesus was born of the Virgin Mary, this is all in the Qu'ran, but by the same token they never deify Jesus. He is not deity to them. He is not God. This is a different Jesus, and the Apostle Paul warns us in 2 Corinthians 11:3-4 about now following a different Jesus, different Gospels, and different spirits that will come along to deceive us. It is our responsibility to know what we believe so that when these other religious systems come along that mention a Jesus that we are able to discern whether they are talking about the real one or an imposter. Dr. Reagan: What we are talking about is really two different gods here? Dr. Reagan: For example, the God of Islam is an arbitrary God. He is so arbitrary that even Mohammed said he didn't know for sure if he was saved or not, because salvation is just going to depend at the last judgment on whether God wants to save you or not, and you might never know. The only hope you have is maybe to die fighting as a martyr for Islam. Nathan Jones: That's an excellent point, that Islam's salvation is totally different from the salvation taught in the Bible, right? Eric Barger: Exactly, martyrdom is the only sure way in Islam for salvation. If you've done too many bad things you just don't know if you're going to make it in. Even if you followed the Five Pillars of Islam — the legalism of Islam — one just doesn't know. Islam has what's called Recording Angels. One writes down all the good stuff you do and one that writes down all the bad stuff you do. If the one writing down the bad stuff has more on his ledger than the one who writes down the good stuff, then you don't know if there's a way out of trouble except for martyrdom. That's so tragic. 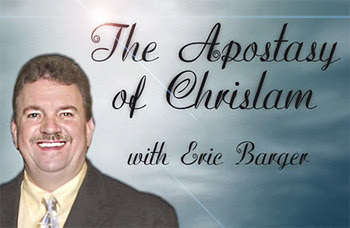 In the third segment of this series with Eric Barger on Chrislam, we will discuss what the Insiders Movement is. The way people tend to talk about allah, one may think that allah actually exists. Saying things like allah is not the same God as in the Bible makes it sound like they are not the same but there IS an allah. Isn't the truth, and the way to make it as clear as possible, is that THERE IS NO ALLAH. allah is not a god but a myth. there is NO allah. That is an alternative stance that I thought about but didn't mention. I would agree with that statement, Susie. The characteristics of Allah match Satan's character – power hungry, bloody, lying, won't share authority, enslaves humans, etc. Thank you for this insight. It made me more grateful of what the Lord Jesus has done on the cross to assure me of my salvation.